Distinctive observations and reflections of the country over several years by the photographer. On holiday in Crete in 2006, a chance meeting by Robert Burns with three Ukrainians kindled an interest that has brought the Glasgow photographer back to that ravaged country again and again. Best known for his coverage of jazz festivals, Robert is internationally recognised as a fine art printer for his ability to get the best results, not only from his own creations, but also from the negative of other photographers (for example Margaret Watkins and David Peat). This exhibition demonstrates his keen interest and empathy for the plight of the ordinary people in Kiev and other nearby towns and cities. He has recorded the joys and the sorrows of Ukranian life, the weddings, the festivals, children at play and vibrant street life. 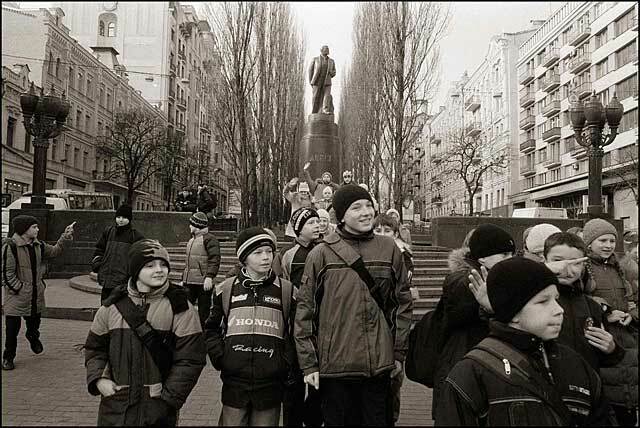 © Robert Burns, "Lenin Statue"